A quadrilateral is a polygon of four sides. A pentagon is a polygon of five sides, Fig. 43. 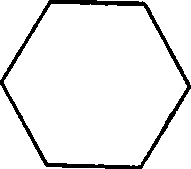 A hexagon is a polygon of six sides, Fig. 44. 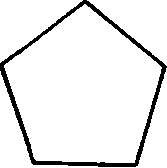 A heptagon is a polygon of seven sides. 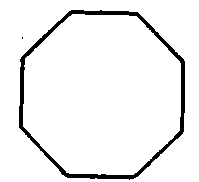 An octagon is a polygon of eight sides, Fig. 45. 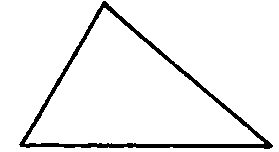 A triangle is a polygon enclosed by three straight lines called sides. 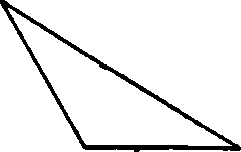 The angles of a triangle are the angles formed by the sides. Fig. 47. Acute Angled Triangle. 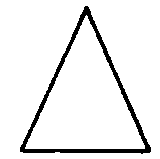 An equilateral triangle is one having all of its sides equal, Fig. 49. 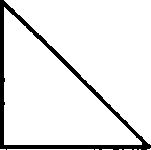 An equiangular triangle is one having all of its angles equal. 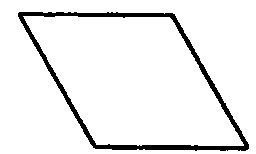 An isosceles triangle, Fig. 50, is one, two of whose sides are equal. 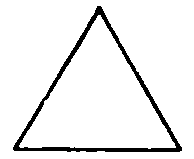 A scalene triangle, Fig. 51, is one, no two of whose sides are equal. 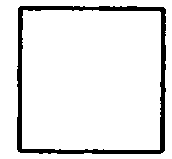 A quadrilateral is a polygon bounded by four straight lines, as Fig. 52. A trapezium is a quadrilateral, no two of whose sides are parallel. A trapezoid is a quadrilateral having two sides parallel, Fig. 53. The parallel sides are called the bases and the perpendicular distance between the bases is called the attitude. A parallelogram is a quadrilateral whose opposite sides are parallel, Fig. 54. Fig. 56, is a parallelogram all of whose sides are equal and whose angles are right angles.